Finding an effective technical indicator that accurately provides buy or sell signal is a hard tusk for every beginner in forex trading. This post is aimed not to describe the way of selecting effective indicators rather to describe the way of using some technical indicators effectively, through bullish divergences and bearish convergences. A bullish divergence occurs when the new high price is not confirmed by a new indicator high. On the other hand, A bearish convergence occurs when the new low price is not confirmed by a new indicator low. Actually, the principle of bullish divergence and bearish convergence is developed by the comparative relationship between the price and indicator movements. Bullish divergence and bearish convergence are found on the most of the oscillators' window and some other indicators' window. Here we have chosen the RSI indicator to explain the bullish divergence and bearish convergence. In the above figure , the bullish divergence and bearish convergence situations are illustrated. Along this post, you will learn the situations in details with practical examples and illustrations. 1 This bullish divergence situation is introduced when the new price high is equal to the previous price high, but the indicator reaches lower than the previous low. Practical example is in the image below. When a bullish divergence is made, a sell order on the currency pair is suggested. 2 The second bullish divergence situation is created when the price reaches to a higher high and the indicator reaches to a lower low. This bullish divergence is strongest among the all bullish divergences. A sell order is suggested here also. Practical example of this bullish divergence situation is illustrated in the image below. 3 Third bullish divergence situation is found when the price reaches to a higher high but the indicator remains equal to the previous level.A sell order is suggested in this situation. Practical example of this bullish divergence situation is illustrated in the image below. 4 This is the first bearish convergence situation where the price fails to make a lower low but the indicator makes a higher high. A buy order can be placed here. Practical example of this bearish convergence situation is illustrated in the image below. 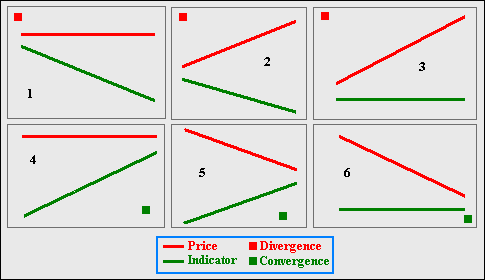 5 The second bearish convergence situation is found when the price makes a lower low but the indicator makes a higher high. A buy order can be placed here. Practical example of this bearish convergence situation is illustrated in the image below. 6 The second bearish convergence situation is found when the price makes a lower low but the indicator fails to make a lower low. A buy order can be placed here. Practical example of this bearish convergence situation is illustrated in the image below. Dear traders, I hope this post will be a great gift in your trading career. At the divergence/convergence points you should look for the candlesticks pattern, chart pattern and breakout,and confirmation of reversal/continuation by any other technical indicators. Divergence and convergence with RSI can be applied on any time frames. The range of the RSI is not that important here. You just need to compare the movement of price and movement of RSI. Hope you got the answer. Divergence is signaled by two peaks on prices, and 2 peaks on oscillator. The second peak of prices would probably not happen on the same day as second peak as oscillator. If so for what gap in days would you still consider divergence as valid? Yes, we will consider that as divergence or convergence, but we should aware of the change in sentiment during the weekend.